The Opera House on the banks of the River Lee is the venue for 2017’s first gigs of note here in Cork. Tonight, three time Irish album of the year nominee, James Vincent McMorrow plays his second of two sold out shows. His 2016 offering ‘We Move’, which is arguably his best work to date, is hotly tipped to pick up last year’s album of the year accolade. Upon hearing her name and work being discussed in all the right circles, Dubliner Maria Kelly was selected by McMorrow to open up this brace of shows. Accompanied only by her acoustic guitar, Kelly took to her task at a time when most of the punters were partaking in light refreshments. Those of us who did bother to listen were treated to a brief but enjoyable set. Kelly’s minimal approach was at times hampered by the hustle and bustle of latecomers, but her song writing talent and flawless vocals still shined through. In Particular ‘Stitches’ and ‘Pretend’ stood out, along with an untitled track which really impressed, in spite of a guitar tuning issue mid way through. By the time James Vincent McMorrow took to the stage the crowd had just about scampered to their seats. The gorgeous ‘Red Dust’, performed alone, set the tone for the evening as McMorrow got an early chance to showcase his wonderful vocal range. Four band members join in next for a funkier than usual version of ‘I Lie Awake Every Night’ which was excellent, however; what struck me, was that all bar the excellent drummer were multi-instrumentalists. (not something you’d see every day). A lot of the more well-known numbers were given a new twist this evening, most of which, like the aforementioned ‘I Lie Awake Every Night’ benefit from this approach. ‘Get Low’ had what sounded like a steel drum outro and ‘Down The Burning Ropes’ an underlying, driving beat that was far heavier than its original recording. However you can’t keep everybody happy, and I don’t think I was alone in my slight disappointment (and it is only slight) at tonight’s version of ‘Gold’. This song in particular I was hoping to hear in its original form but it must be said, that the alterations certainly didn’t detract from this evening’s overall experience. The Dubliner had spent the day using the venue to record a new video for upcoming single ‘One Thousand Times’ and his exertions, coupled with last night’s show, have clearly taken their toll on his vocals. He acknowledged this fact after his spectacular reworking of Steve Winwood’s 1986 pop-anthem ‘Higher Love’. 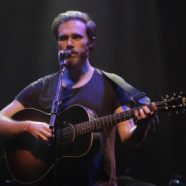 In his defence a slightly, raspier James Vincent McMorrow vocal would still be the envy of most of his contemporaries. This jam packed set included the whole of the new record while still managing to play tracks from the first two records. Strangely enough, it was the older songs which seemed to get the best receptions. The new stuff did go down well, but songs like the fantastic ‘If I Had A Boat’, ‘Breaking Hearts’, and ‘We Don’t Eat’ were far more well received. The finishing number ‘Cavalier’ which is also from the back catalogue, was beautiful and was met by a standing ovation.